Earth return of Japan's Hayabusa asteroid probe and release of its sample capsule. AJapanese spacecraft that visited an asteroid in 2005 is returning to Earth thisweekend and should put on a brief, but spectacular, light show for fortuitouslyplaced Australians late on Sunday. Nowit is set to land back on Earth, hopefully with asteroid bits in tow. TheHayabusaspacecraft will enter the Earth's atmosphere at a rather shallow angle of12 degrees and a speed of 7.6 miles per second (12.2 kilometers per second),and is expected to impact Earth in South Australia near the Australian DefenseForce facility at Woomera. The Woomera Prohibited Area, as it is officiallyknown, stretches for 49,000 square miles (127,000 square kilometers) in thenorthwest of South Australia. Thetime of reentry is scheduled for 13:51 GMT Sunday, which corresponds to 11:21p.m. local time for Woomera. Australia Department of Innovations' Michael Greensaid people in the vicinity should be able to see the spacecraft's reentry. "Therewill be obviously a reentry trail that will be visible, weather permitting, andthat will be like a shooting star in the sky as it comes in to Woomera,"he said. Accordingto NASA, the fireball-like meteor effect created by Hayabusa might attain apeak brightness of magnitude -6.8. This would be 12 times brighter than theplanet Venus, which is currentlyvisible in the western sky for a couple of hours after sunset. Therange of visibility is somewhat uncertain, but could extend anywhere from about400 to 700 miles (600 to 1,100 km) centered on Woomera. Places that have a goodchance of seeing the reentry trail include Leigh Creek and Andamooka (to thenorth-northeast of Woomera) and Port Augusta (to the south-southeast ofWoomera). Adelaide, the capital of SouthAustralia and Australia?s fifth-largest city, with a population of more than1.28 million, could be right on the edge of the visibility zone and mightpossibly see the bright streak very low on their north-northwest horizon. TheHayabusa spacecraft met with the asteroid 25143 Itokawa as planned and returnedspectacular images of this cosmic rock, which measures roughly 1,700 by800-feet (540 by 240 meters). Afterarriving at Itokawa,Hayabusa studied the asteroid's shape, spin, topography, color, composition,density, and history. 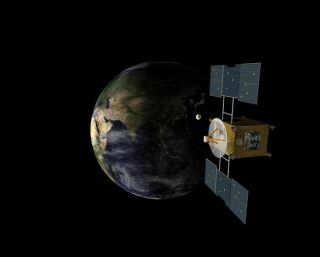 OnNovember 19, 2005, the spacecraft touched down on the surface of the Itokawa asteroidwith its sample capturing device and attempted to collect a sampling of dustand pebbles, but the procedure did not go as planned. Mission scientists areconvinced however, that there is a very good probability that some asteroiddust managed to swirl into Hayabusa's sampling chamber, so it was sealed. Duringits journey home, the spacecraft lost some attitude control and is now limpingback to Earth and is scheduled to return to on Sunday. Otherspacecraft, notably Galileo and NEAR Shoemaker, have passed close to asteroidsbefore, but the Hayabusa mission, if successful, will mark the first time thatan asteroid sample is returned to Earth for analysis. OnSunday, the 1,124 lb (510 kg) space probe will reenter the Earth'satmosphere. Since the reaction control system no longer functions, the reentryis expected to mimic the approach of an asteroid along with the sample reentrycapsule, and scientists are predicting that the majority of the spacecraft willdisintegrate as it flies through the atmosphere. Thesample reentry capsule, roughly the size of a basketball and weighing 39.6pounds (18 kilograms), should be able to make it back to Earth intact, thescientists say. Anattempt will be made to provide a live video feed of the Hayabusa reentry around13:51 GMT. Thevideo will be chosen from cameras operated onboard NASA's DC-8 AirborneLaboratory by Jesse Carpenter and Greg Merkes of NASA Ames Research Center, orthose operated by Ron Dantowitz, Marek Kozubal, James Brietmeyer and BrigitteBerman of Clay Center Observatory, or those operated by Mike Taylor andJonathan Snively of Utah State University. Thevideo feed will be transmitted by the DC-8 aircraft via INMARSAT, though it maynot be of high quality. Joe Rao serves as an instructor and guest lecturer at New York's Hayden Planetarium. He writes about astronomy for The New York Times and otherpublications, and he is also an on-camera meteorologist for News 12 Westchester, New York.